A few days’ break from the daily commute for a first visit to Iceland: enough time to discover that, while every country is unique in one way or another, Iceland has more claims to uniqueness than most. The rift valley shown in the photo above illustrates one aspect of this: Iceland itself straddles the American and Eurasian tectonic plates of the earth’s crust, and the land masses either side of this valley are being dragged apart at around an inch a year. My first impression of Icelandic people was of a polite, Scandinavian sort of blandness; but if Marteinn Briem hadn’t already dispelled this for me, I think I would have soon come to detect more in them. Historically they have not been an independent country for long; first colonised by Vikings a thousand plus years ago, they were a dependency of first Norway and then Denmark for some 700 years until 1944, when their occupation by the Allies, while Denmark was under the heel of the Nazis, led to their eventual independence. So while what ties they have are mainly to Europe, they are obviously set apart geographically. Their language, sounding to our ears Scandinavian but with a certain alien twang, is famously hard to learn and derives originally from Old Norse. The Sagas originating from that early era are at the core of Icelandic culture, and it’s said that the language in which they are written is perfectly understandable to modern Icelanders, while of course Old English texts from that period are incomprehensible to today’s English speakers without extensive training. In the world there are around half a million Icelandic speakers – approximately the population of Sheffield. As in most countries without widely spoken languages, virtually everyone is fluent in English; but of course Icelanders can be more confident than most that no outsiders will understand their native tongue. Walking around Reykjavik, visiting cafes and shops, you are aware of Icelanders switching smoothly and effortlessly between English (mostly) and their own language as required, so that a private local community is effectively preserved amidst the onslaught of tourists such as ourselves. I didn’t detect anything hostile or xenophobic about this; just the understandable desire to guard national identity. In all but a few cases the friendliness with which we were received seemed quite genuine. But this peculiarly Icelandic ambivalence is understandable especially in the light of recent history: the banking crisis affected the country more radically than most; the Icelandic kroner crashed, and as a result cheaper travel to the country has now caused tourism to take over from fisheries as the country’s principal industry. And Icelanders are quite adept at drumming up trade. 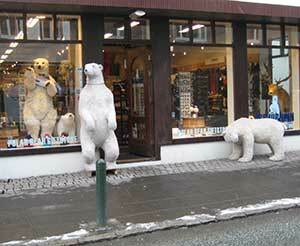 In Reykjavik polar bears – fake, stuffed or animated – are on hand to attract us into the shops, as my photo shows. 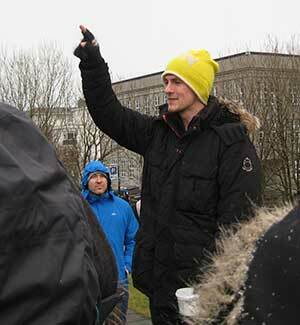 And no matter, as our guide Marteinn pointed out, that no real polar bears live in Iceland. 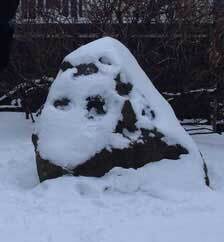 The joke is on us, the tourists; but there’s no malice involved. This was underlined for me when, as I lined up for my photo, taken across Reykjavik’s main shopping street, waiting for the cars to pass, I realised that they had stopped to let me take it. I can’t think of any other cities where that would happen. Neither can I think of any other cities that offer such contrasting sights in a small area. There are ostentatious and confident modern buildings, such as the concert hall that overlooks the harbour, clad in coloured strip lights that coruscate at night like sequins on a dancer’s dress. 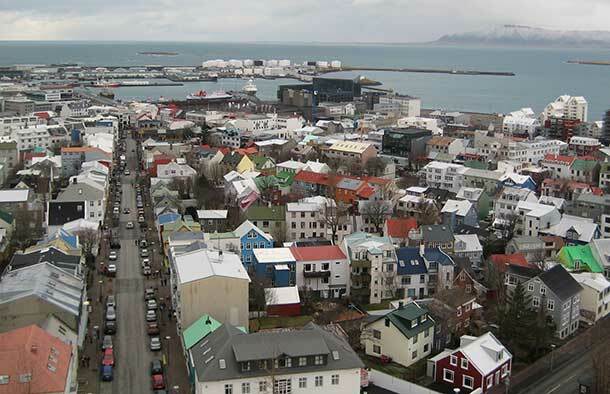 But much of the city consists of the traditional clapboard houses painted in contrasting colours, seen here from the top of the Hallgrímskirkja, the cathedral that stands on the central hill – itself a pretty remarkable piece modern architecture. Once back in the street, and getting a bit cold and footsore, we took refuge in one of the warm, welcoming, cluttered cafés where we could have hot chocolate or traditional lamb soup. By this time I had collected in my camera more images that suggested the somewhat askance world view of Icelanders; here are two examples of the quirky murals to be found all over town. The explosive and unpredictable nature of Iceland’s physical environment must be a factor in the national character. There was the famous volcanic ash cloud of spring 2010 when, according to Marteinn Briem, the volcano (with the appropriately unpronounceable name of Eyjafjallajökull) had erupted in the south of the country, and the ash cloud blew south. As a result European air traffic was grounded while Icelanders could fly around their country as normal; this gave rise to much innocent schadenfreude. We found the natural phenomena to be just as capricious as the Icelanders themselves: the Northern Lights refused to show, even on the few occasions when the sky partially cleared. 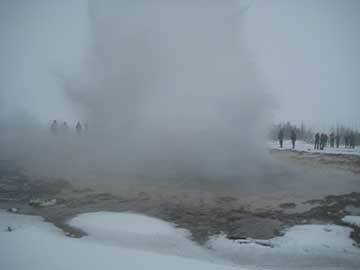 However we did see a geyser. My photo of one blowing may not look that impressive, but you should view it with respect – your intrepid blogger undertook a 6 hour return coach trip, and it then took a 400 metre walk and a ten minute wait in a driving blizzard to land this image. As I say, a country where it’s normal for boiling steam to erupt from the snow must be bound to confer some contrary characteristics on its people. I noticed how Marteinn and most of his compatriots who mentioned the Huldufolk, or hidden people, left you with a carefully cultivated sense of uncertainty as to whether they actually believed in them. My feeling was that this was an expression of the subversive Icelandic sense of humour – as well as a useful draw for tourists. 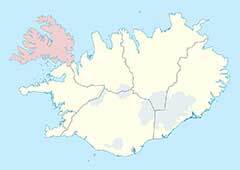 All this added to the impression of Iceland as a sort of court joker to the rest of the world; even the map of Iceland has the Ísafjörður peninsula in the northwest, appearing like rakishly worn cap and bells. The country is historically linked with Europe but claims the licence to mock its failings – a Fool to Europe’s King Lear. 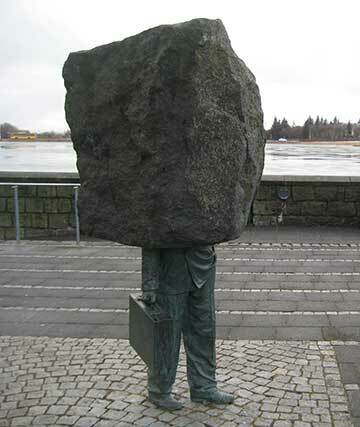 What summed this up for me was a sculpture that stands near the centre of Reykjavik: it’s called The Unknown Bureaucrat, and in characteristic Icelandic fashion it celebrates the notional worker who gets things done and keeps everything functioning – but at the same time pokes fun at him. Maybe it also appealed to Duncommutin because he saw himself in it: only three months remain before I drop my brief case and free my head from the big stone block of work and commuting in which it is embedded. This entry was posted in Places and tagged geyser, graffiti, history, Iceland, Icelandic, language, Marteinn Briem, national character, Reykjavik. Bookmark the permalink. I’ve heard Marteinn recommended in a few different blog’s now, so will try to hunt him down. Thanks for the tips! 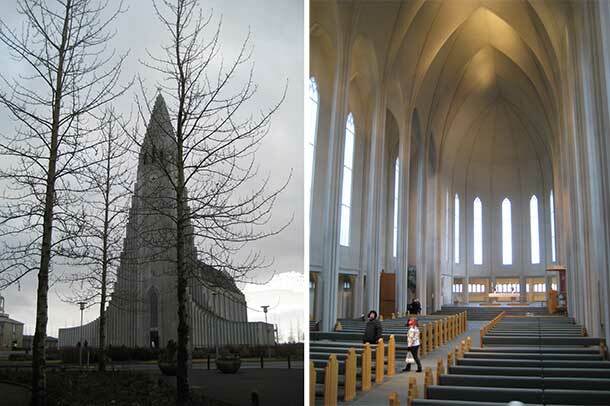 Much enjoyed this post and reminded me that would love to go to Iceland one day. It seems to be a place with a different insight on things. The Unknown Bureaucrat probably echoes with a lot of us! You might be interested in two of Jarvis Cocker’s Wireless Nights broadcast from Iceland. Thanks! I’ll have a listen.